At high noon on March 7, the A. 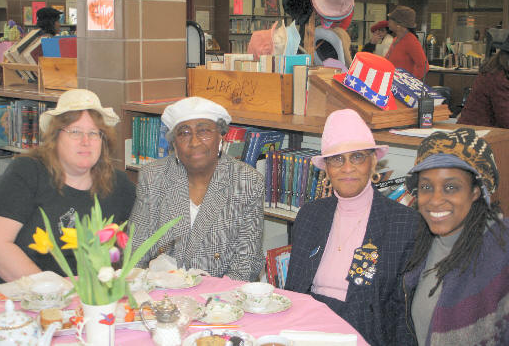 B. Davis Middle School was transformed into a spring sanctuary, to celebrate the third annual Ladies Hat Party and Tea. The Family and Consumer Sciences Department with Attendance Officer Dawn Jackson, hosted the stellar ladies-only event, in honor of Women’s History Month. 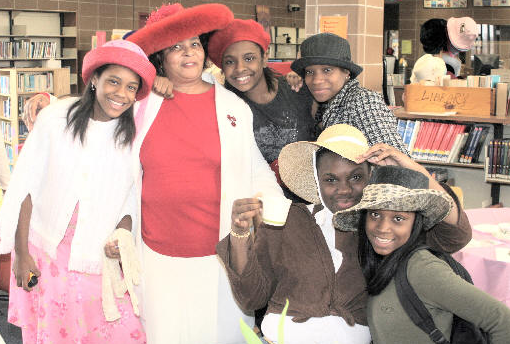 Murdisia Orr, the school’s principal, initiated the tea three years ago, with less than a dozen students in attendance. 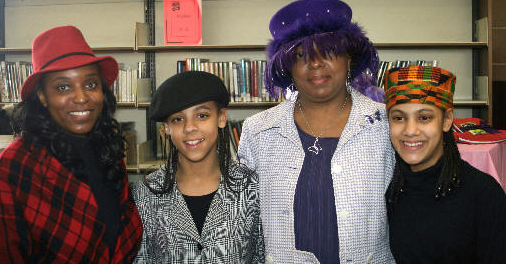 Orr stated, “I felt the girls needed socialization, character education, and how to be young ladies, so that they would be ready as middle-schoolers to learn proper etiquette.” Attendance for the event has blossomed to more than fifty students, who participated throughout the course of the school’s four lunch periods. Staff participation from the Family and Consumer Sciences Department was critical to the success of the event. Mrs. Barvis, Ms. Bisordi, and Mrs. Ferrell, created decorative bookmarks, and arranged brilliant multi-colored tulip centerpieces for each table. 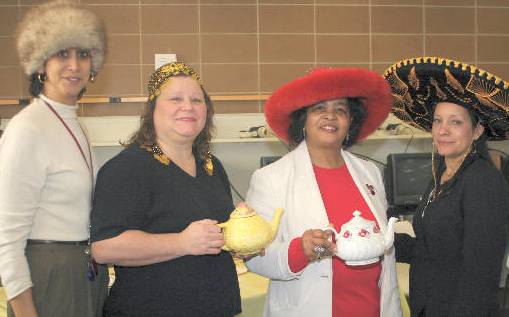 The department also provided butterfly tea service settings for the event. Teachers poured tea for guests, served delicious sandwiches, and decadent desserts. Many of the students opted to wear straw hats and understated fedoras, either with a fabric band, a small feather or a bow. Throughout the afternoon, they gathered at their respective tables, and posed for numerous pictures, some with teacups in hand. 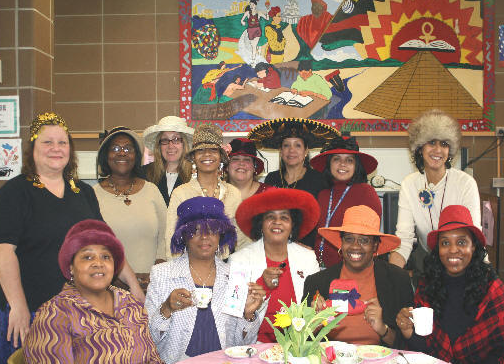 The teachers and community guests sported more extravagant, and somewhat daring millinery in bold colors, festooned with large feathers, fruits, and bows that were magnificently eye-catching. Several women had coordinated their outfits to make a strong monochromatic statement in red, purple, yellow, orange, or black. International hats also made an appearance, including a sombrero, and several made of Kente cloth. The mood was joyously festive, and provided an opportunity for invited guests to have a small repose from their normally busy schedules. Among the many guests were Superintendent Brenda Smith; City Clerk Lisa Copeland; Schools Trustee Dr. Rose Niles-McCrary; Arts Administrator Angela Addesso; and Executive Director of the Youth Bureau, Camille Banks-Lee. Numerous teachers, and staff from throughout the district were in attendance as well. A student-led quintet provided musical interludes throughout the afternoon. Guests also had the opportunity to browse at a small boutique set up by Mount Vernon resident, Beatrice Jackson of Bee’s Creation. Jackson sold hats, jewelry, scarves and numerous accessories, with a portion of the proceeds generously donated to the school’s PTA fund.